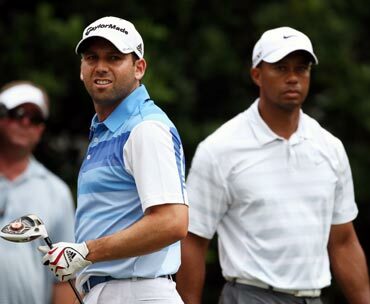 Spaniard Sergio Garcia has apologised after a "fried chicken" jibe aimed at world number one Tiger Woods during a European Tour awards dinner on Tuesday. Garcia, who has a frosty relationship with Woods, was on stage with his Ryder Cup team mates when he was asked in jest whether he would be inviting Woods for dinner during next month's US Open in Merion. "I apologize for any offense that may have been caused by my comment on stage during The European Tour Players' Awards dinner," he said. Garcia and Woods have been at loggerheads recently after the Spaniard blamed a roar from the crowd watching the 14-times major winner for an errant shot when the two featured in the same group at the Players Championship in Florida.